Leicester manager Claude Puel admitted Brighton deserved more after the Foxes scored two late goals to win at the Amex on Saturday. Puel felt his side did not show enough aggression or quality in the first half and Albion had several openings to take the lead. 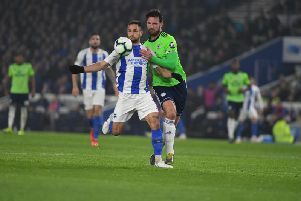 Glenn Murray fired wide when through one-on-one in the first half, Pascal Gross was denied early in the second period by Leicester keeper Kasper Schmeichel, who also kept out Murray's penalty. The Foxes then snatched all three points with goals from Vicente Iborra and Jamie Vardy, with midfielder Wilfried Ndidi sent off for a second booking in between the goals, and Puel said: “First of all I’d like to congratulate Chris Hughton and his team because they played very well and perhaps at the end they deserved another result. “They played very well in the first half and for us it was the opposite. There was not enough aggression in our play and not enough quality. “It was a good score for us to be 0-0 at half-time. It was important to come back with ambition after half-time and there was better balance in our performance. “I think the (penalty) save from Kasper Schmeichel was the turning point of the game because it gave us a good boost, but it was the opposite for the opponent.